Earlier this year MuleSoft completed our second annual SaaS Vendor survey with our research partner THINKstrategies. The goal was to quantify the importance and impact of integration on the business execution by leading SaaS providers. One of the most surprising findings in the report is that SaaS Integration is now an Executive level concern. Like anyone else who has worked in middleware for the last 10-15 years, I’ve mostly heard from engineering and IT about the challenges of integration, given their involvement in solving these challenges directly. Now, as most new business applications purchases are SaaS based (more by LOB than IT, btw), it’s not surprising that the customers quickly seeing the limitations of SaaS to connect to other parts of the business. Even the least tech savvy marketing executive understands that lead flow from their marketing automation can push those leads into their SFA tool. But it doesn’t stop there. With the digitization of advertising, and the real-time capture of customer interactions on social, mobile, and web applications, Marketing now demands the automation of those interactions and data directly to their sales team as soon as a web visitor fills out a form on their website (typically another SaaS based application like Drupal), and may want that customer interaction augmented with other social data about that visitor gleaned from their cookie history, or other public social information. This socially enriched data, coupled with their direct interaction with the web site, needs to be synchronized across three to four applications to ensure the sales cycle is initiated in real-time, and that all customer interactions are recorded along the way for future nurturing, campaigns or big data analytics. Lack of integration drives up dissatisfaction and increases churn rates, which have a negative drag on MRR growth. 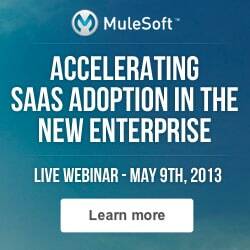 Learn more about the key findings of the SaaS Integration report, and how Integration can positively impact key SaaS metrics by attending our upcoming webinar, Accelerating SaaS Adoption in the new Enterprise on May 9th.